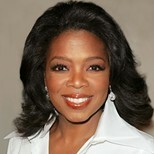 The Oprah Winfrey Show has remained the number one talk show for 20 consecutive seasons*. Produced by her own production company, Harpo Productions, Inc., the show is seen by an estimated 48 million viewers a week in the United States** and is broadcast internationally in 132 countries. In April 2000, Oprah and Hearst Magazines introduced O, The Oprah Magazine, a monthly magazine that has become one of today's leading women's lifestyle publications. It is credited as being the most successful magazine launch in recent history and currently has a circulation of 2.3 million readers each month. In April 2002, Oprah launched the first international edition of O, The Oprah Magazine in South Africa, extending her live your best life message to another broad audience. "I was taught to read at an early age. By the time I was three, I was reciting speeches in the church. They'd put me up on the program, and say, 'Little Mistress Winfrey will render a recitation,' and I would do 'Jesus rose on Easter day, Hallelujah, Hallelujah, all the angels did proclaim.'" "It doesn't matter who you are, where you come from. The ability to triumph begins with you — always." "I really became frustrated with the fact that all I did was write check after check to this or that charity without really feeling like it was a part of me."